Think okra is slimy? Think again, with this spicy grilled okra – crunchy, creamy, and totally delicious. 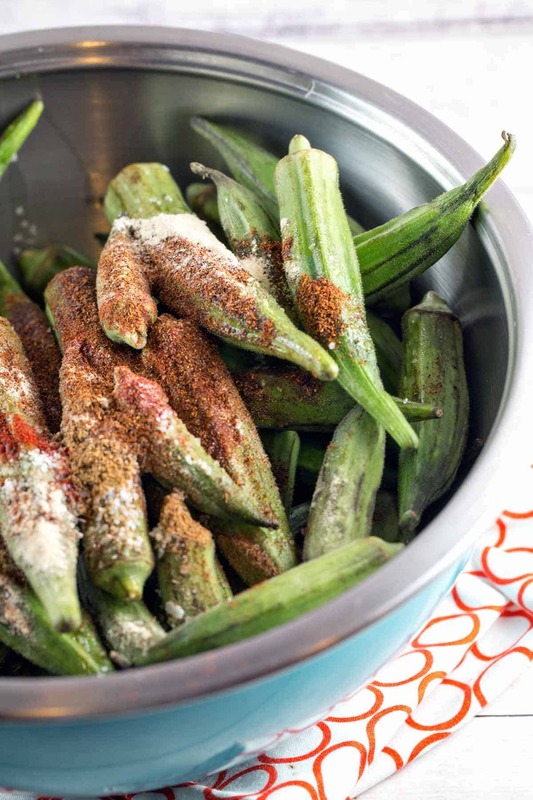 Plus, the top cooking tips to keep your fresh okra slime-free! Let’s take a little break from summer desserts this week, and talk about one of my absolute, all time, most favorite foods: grilled okra. A little unexpected? Perhaps. I’m not from an area or culture that frequently cooks with okra; in fact, I’m not sure if I ever even tried okra before I was in my 20s. I owe my recent love affair with okra to our CSA few years ago, who packed up a few pounds of okra into our weekly box. I had never made okra before and wasn’t quite sure what to do with it. So I did what I do with all the vegetables that leave me stumped: throw them on the grill. Suffice to say, I was hooked. Now I spend my summers grilling as much fresh okra as I can find, and roasting it in the winter (a close second to grilling). Now, look. At the end of the day, this is still okra. 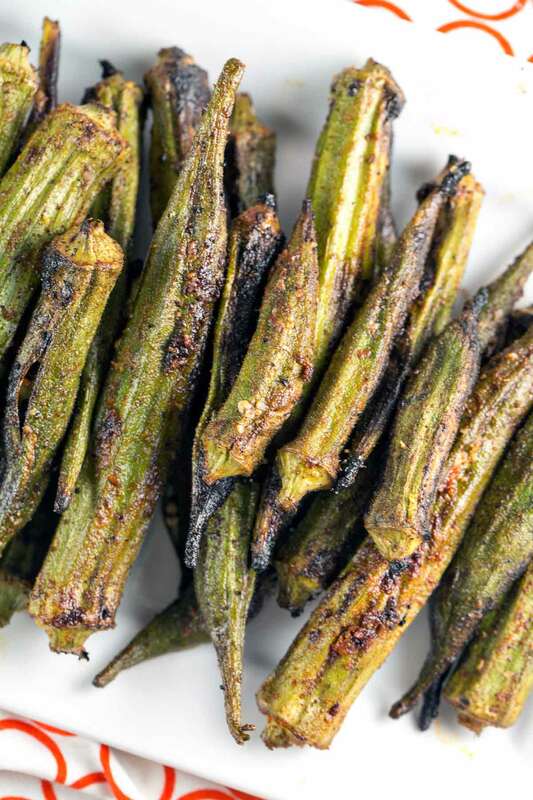 Grilled okra isn’t a french fry or a mozzarella stick or any other crunchy, salty, delicious food. But it’s about as good as a vegetable comes (and I generally love vegetables). Let’s talk a little about okra, before I get into why I love spicy grilled okra so much. Okra gets it slime from mucilage, which is that sticky, slimy substance that seems to ooze from okra. Mucilage is composed of sugar residues called exopolysaccharides and proteins called glycoproteins, both of which thicken when heated. Mucilage is produced by nearly all plants, but okra produces it in much greater quantities (so do other sticky plants – like aloe and licorice root). This increased viscosity is great when it comes to gumbo — the mucilage acts as a thickening agent. 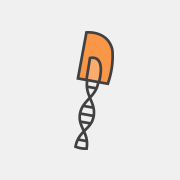 Buuuuut… it can also make okra feel pretty slimy. There’s a reason you don’t usually come across sauteed okra, where there is nothing to absorb this excess mucilage. Choose smaller pods. Smaller pods = less mucilage = less slime. Dry okra thoroughly before cooking. If your okra is at all wet when you start to cook it, it will steam, which will produce more mucilage. Cook okra in a single layer. In other words, don’t crowd the pan! 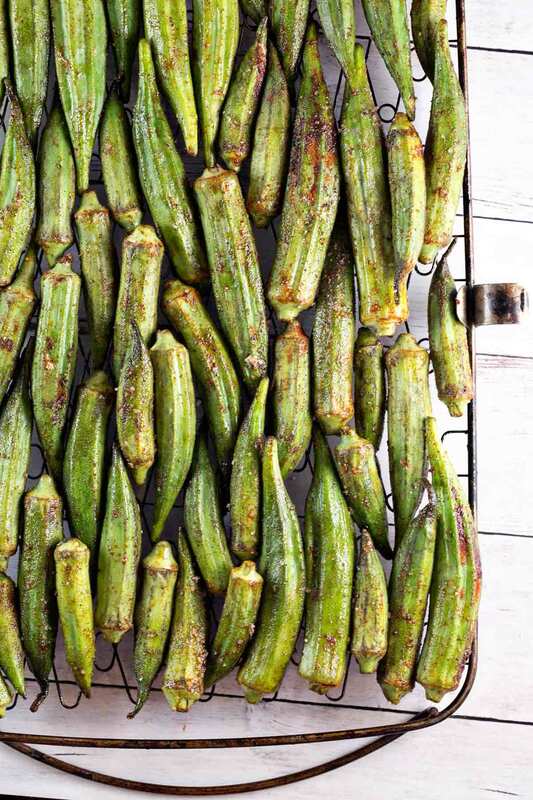 Whether grilling or roasting, cook in a single layer, ensuring that the outside of each piece of okra is exposed and can cook quickly. Well, like we just discussed, the biggest trick to reducing the ‘sliminess’ of okra is to cook it quickly, over high heat. Grilling is a great way to accomplish this – it’s fast and easy. Grilling over high heat means some bits get nice and charred and crispy (i.e., the best part of grilling anything). The seeds have a nice little pop, offset by the creamy inside (because high heat = creaminess, not slime!). Grilled okra is also the perfect side to just about anything you’d toss on the grill: burgers (or my favorite veggie burgers), sausage, fish, chicken, etc. Toss on some ears of corn and these three ingredient grilled potatoes for a true summer feast. Okra itself is a little bland in flavor (almost like an eggplant), so I like to make mine a little spicy. After washing and drying the okra (remember, dry it well!! ), toss with a little olive oil and a heaping pile of spices for a little zing. The smoked paprika adds a smokey flavor, which pairs so perfectly with the charred bits from the grill. Add a little garlic powder, chili powder, cumin, and salt, and toss on the grill. 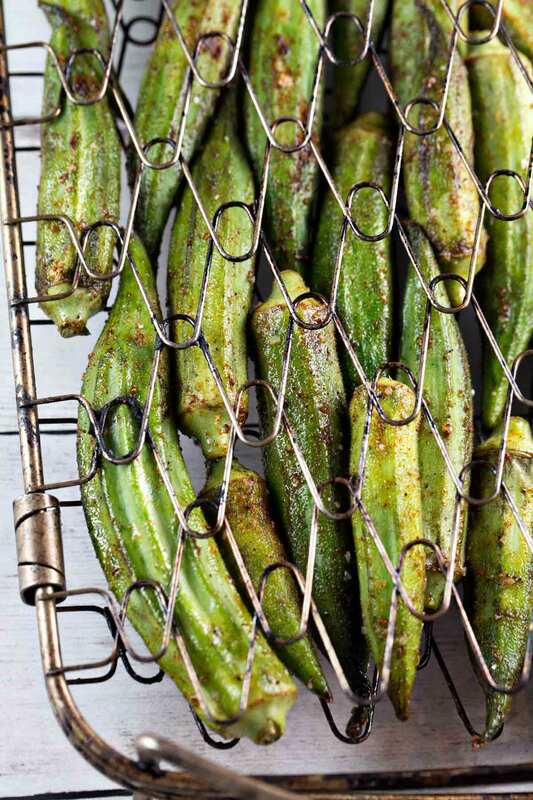 If you’re careful and your okra is large, you can lay the okra directly on the grill grates. I usually put mine in a fish basket (Amazon links may be affiliate) or string them on skewer sticks. Grill for a few minutes per side and that’s it. Perfectly creamy, crunchy, spicy grilled okra… no slime allowed. Think okra is slimy? Think again, with this spicy grilled okra – crunchy, creamy, and totally delicious. In a large bowl, combine okra and olive oil, tossing to coat. Add spices and continue to toss, until okra is evenly coated. Arrange okra in a single layer on a fish basket or skewer on a stick. Grill over medium high heat for 3 minutes with the cover closed. Flip and grill an additional 3 minutes, or until okra is slightly charred and soft in the center. Holy crumbs, YUM! 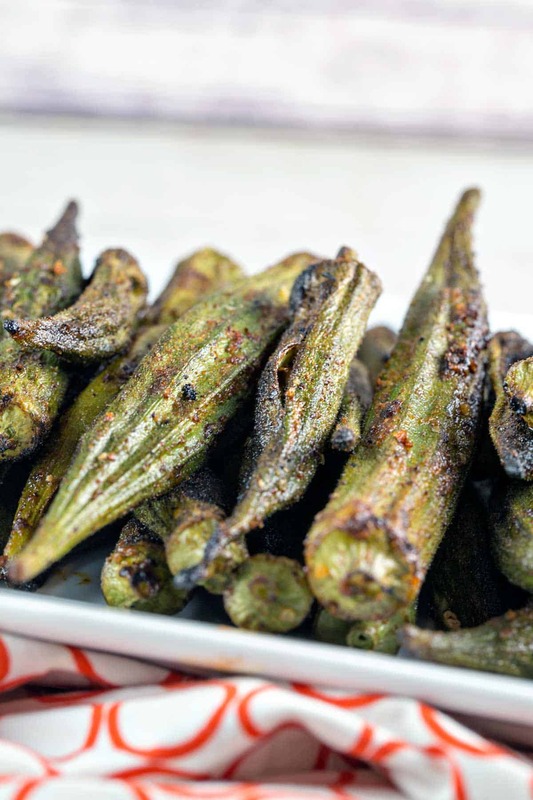 We usually fry our okra, but this is such a great alternative! I’ll have to let the husband know the next time he fires up the grill! Pan fried okra have been my favorite dish on vegetarian days and this is a new twist to my regular recipe.Will surely try this. I LOVE this tutorial. I never knew that you could make okra without the slime. I’m going to have to try this out on my husband. He hates okra only because of the slime. I won’t tell him. He loves grilled food and spicy food so this is really the perfect recipe. Thanks for this! Oh, Boy!! That sounds like an amazing dish! We’ve only used okra in our soups and Gumbos. I’d love to make it this way. We always use plenty of seasoning — and we’d naturally do this to the okra. We are definitely going to try to make it. We don’t have a fish basket but we do have a grill grate with holes so we can make the okra on it. 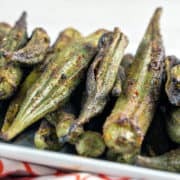 I have a family member who makes an amazing fried okra but I think I might love this grilled recipe even more! We love okra. But I have never tried grilling Okra before. 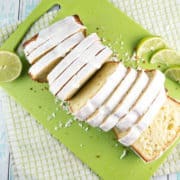 Thos looks so delicious. Saving it for later. OMG the okra slime…I flat-out refused to eat okra until I was adult because of that! I never knew there was a reason for it. I’m still pretty hesitant on anything except fried okra, but I might be willing to give this one a try. I’ll definitely share it with my mom though! I grew up on okra so I’ve loved it since I was a little girl. I like my okra fried. I also like it in my cabbage. But I’ve never had it like this before! 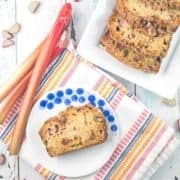 A new recipe for me to try! Love it! Oh I just have to try this as your opening sentence is so me!!! I tried okra once and was so put off by it I haven’t dared try again. But these look so good!!!! I have to say that I think I have tried Okra one time in my life and I don’t even remember if I liked it. Pinning this to try! I always like to try new veggies. Your recipe sounds really good! Super creative way to cook okra! Love how simple and easy the recipe is but packed with tons of flavor. What a great idea! 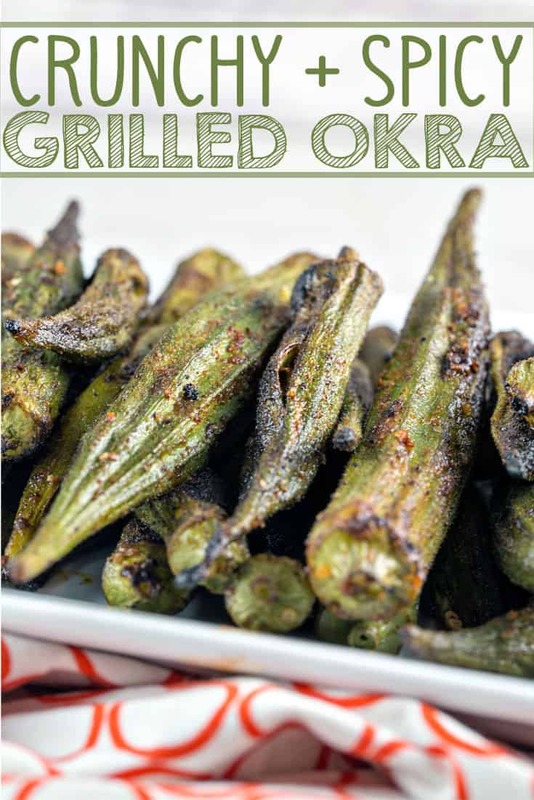 I would have never thought to grill okra, adding this to my list of recipes to try real soon.